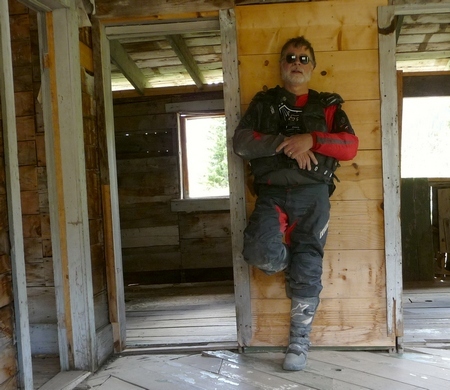 After traveling up to Engineer Pass, I continued my motorcycle trip down into the ghost town of Animas Forks. Here's a view of part of the Animas Forks ghost town complex, taken from across the river. 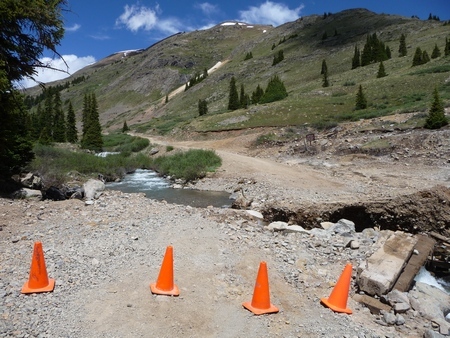 Animas Forks is south of Engineer Pass. Animas Forks is near where the road to Cinnamon Pass takes off, and the road to California Gulch is right at the north end of town. I came down from Engineer Pass and got back on the road leading south. Your first view is across the river (top photo). Then down across the bridge (roaring creek this time of year!) and into the parking area. There are bathroom facilities available. 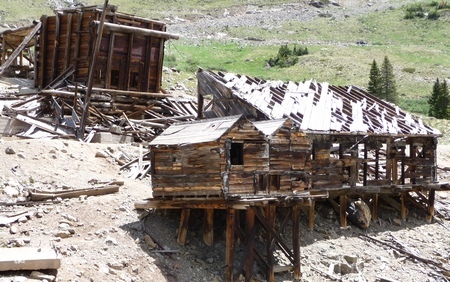 Animas Forks was at one time a bustling little city, the center of the large mining district. But it’s been pretty much abandoned for over a hundred years. 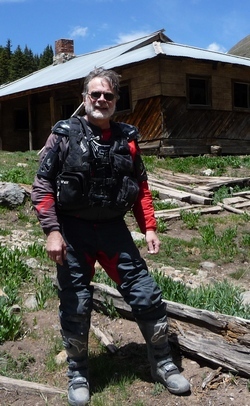 Since access to Animas Forks from Silverton is easy, the area is heavily visited. Do your part and tread carefully. It’s illegal to take any souvenirs! Oops! That bridge has been there for who knows how long, but the heavy runoff this year took it right out. That's the road to California Pass. It's possible to circumvent the bridge, but this involves a steep climb up to a mine, then through the ruins and back down to the road. Lots of tourists, all friendly and interested in talking to a local (I consider myself local) and ready to take a snapshot. One of the first things I discovered is that the bridge leaving town to the northwest is out. This is the road to California Gulch and California Pass, and from there to Hurricane Pass and Corkscrew Pass. The fact that the bridge is out is marked only by those four cones. Note there are no cones on the other side of the creek! There’s a way to get around the bridge, but I’m not sure I’d recommend it. Time takes its toll. As long as the volunteers from the Colorado Historical Society keep the roofs intact, the buildings will usually stand. The buildings are open for you to crawl through, but beware: no one says anything about guaranteeing your safety! There aren’t any handrails. There aren’t any signs saying “don’t step here because the floor is weak.” You, that means YOU, are responsible for your own safety! What's this little item? It's an electrical insulator, showing that the building I was in was once wired for electricty. 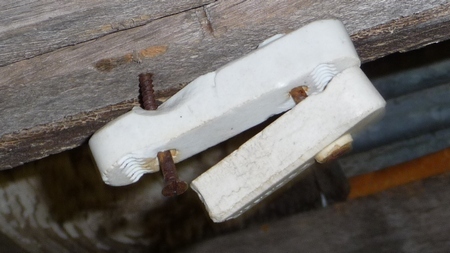 Back then they used separate wires--you can see that two wires can be held by this insulator. The slotted screw is also from the right period—Phillips screwdrivers weren't invented until much later! This is a small mill across the creek. One can circumvent the bad bridge by going up and around these ruins. I can just imagine how many hundred-year-old nails are embedded in the dirt up there! By this time it’s lunch time. I took a self-portrait by setting the camera on a windowsill. I didn’t realize just how tired I looked until I got home and downloaded the pics! I leaned against the wall for this photo taken with the 10-second timer. I knew I was tired at that point, but didn't realize I looked it!